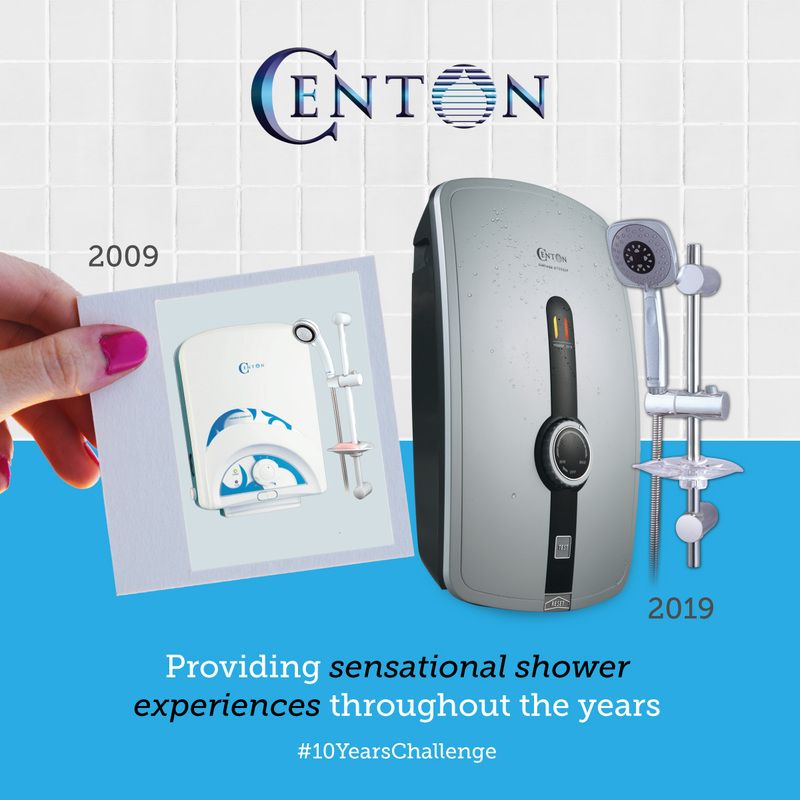 Besides having an efficient municipal council (MPSJ) and also the origin of a respectable political rising star - Selangor's State Legislative Assembly Speaker YB Hannah Yeoh, Subang Jaya now has something new to be proud off. 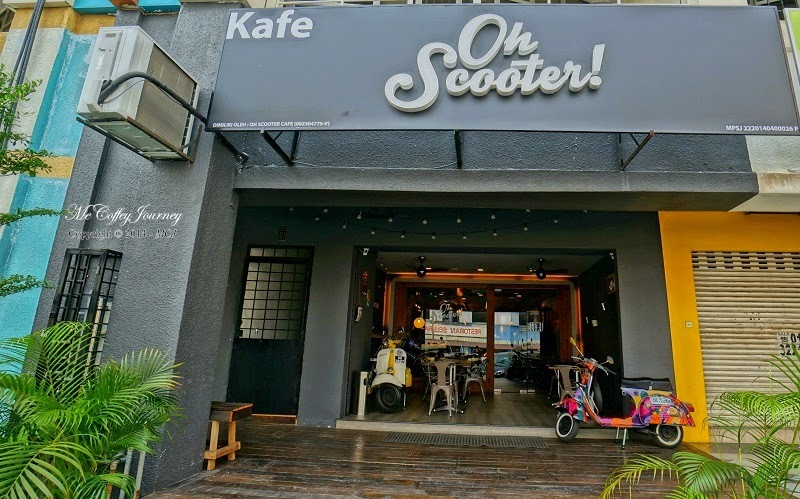 The latest hit Oh Scooter Cafe has yet again placed the USJ district on the map. Graffiti art at the entrance of Oh Scooter Cafe. Located at USJ 21, this commercial area was once relatively quiet before Main Place Residence building construction was revived by Bina Puri, after being thrice-abandon by previous developers. Now, the roads here have being widen with shaded walk ways at the side, and the currently under-construction LRT station will bring this once dead area to life. 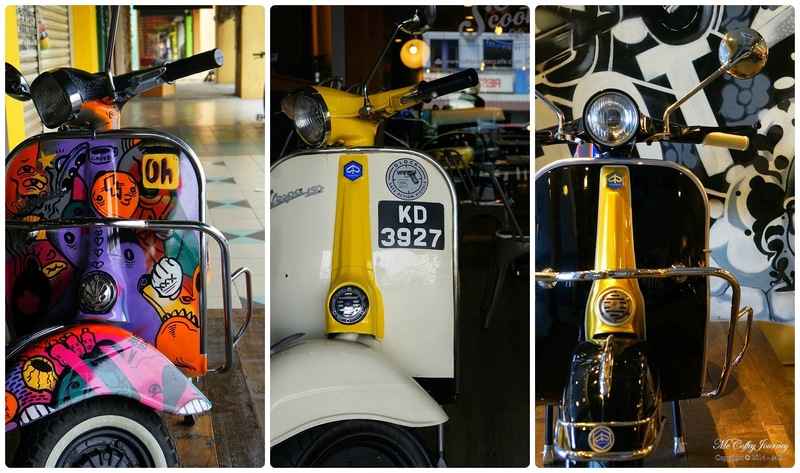 Oh Scooter Cafe was opened by a Vespa-loving family. 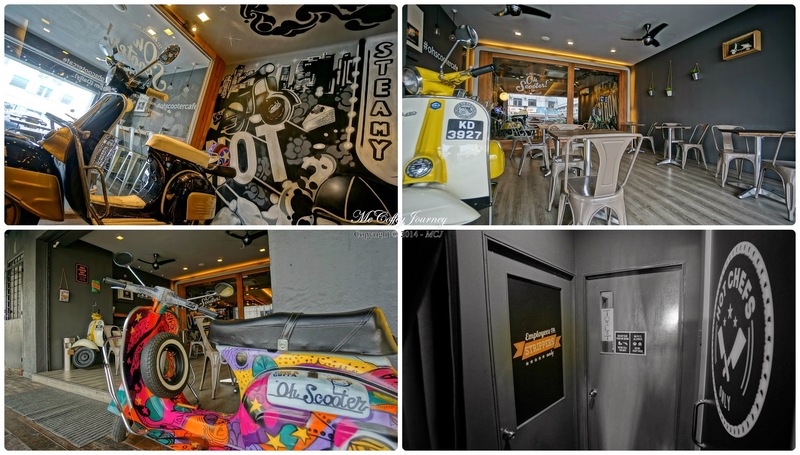 Beside the 3 handsome scooters placed at the entrance, this scooter-themed cafe is also beautifully decorated - scooter-related pictures and wheels on the wall, mini scooter models placed around the cafe, and the graffiti art on the wall near the entrance do strengthen this cafe's scooter concept. Warm yellow lights shine throughout this proportionately long cafe. Since no cooked food is being served here at the moment, kitchen space is spared to make more space for the lounge area. Other than the metal and wooden chairs, comfy sofas can be found at the back of the cafe (elevated wooden-flooring area). 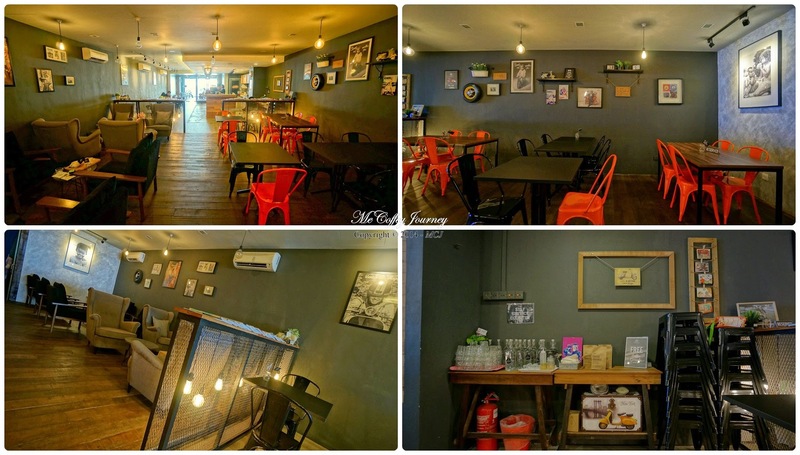 This cafe is proportionately long lounge, from front to back, with the expense of a kitchen. Do take note that Oh Scooter Cafe practices a self service policy, so do that keep an ear out for your name to be called out from the counter when your order is ready. 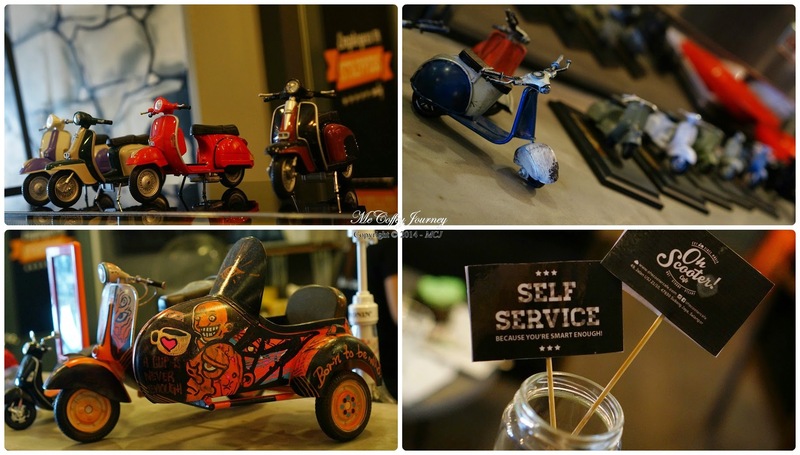 Mini scooter models around the cafes. 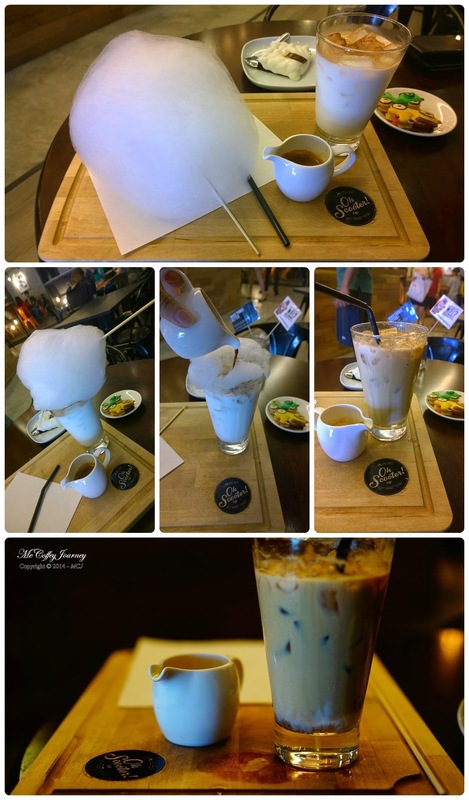 Besides the lovely settings and the gorgeous Vespa scooters, the main gimmick that attract so many caffeiniacs to Oh Scooter Cafe is their cotton candy Signature Coffee! 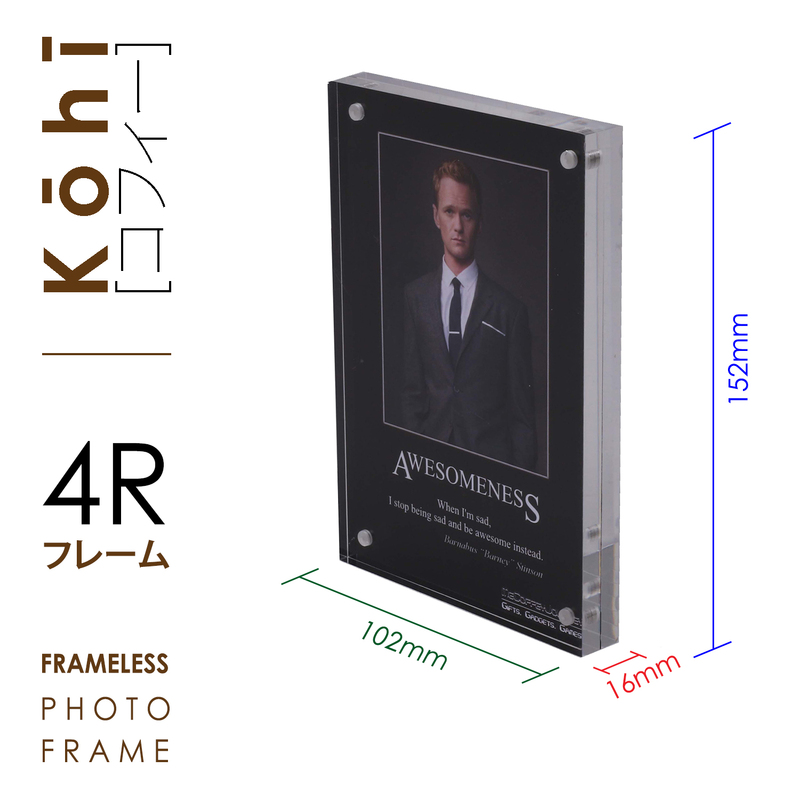 This extremely creative, fun-filled coffee preparation experience is served on a tray, well thought of for the serving convenience, and the anticipation that inexperienced patrons might make a mess while having fun preparing this coffee. Oh Scooter Cafe's Iced Signature Coffee. Sugar level - Mix the cotton candy in the cup of hot milk, cotton candy dissolved instantly as it comes into contact with the milk. 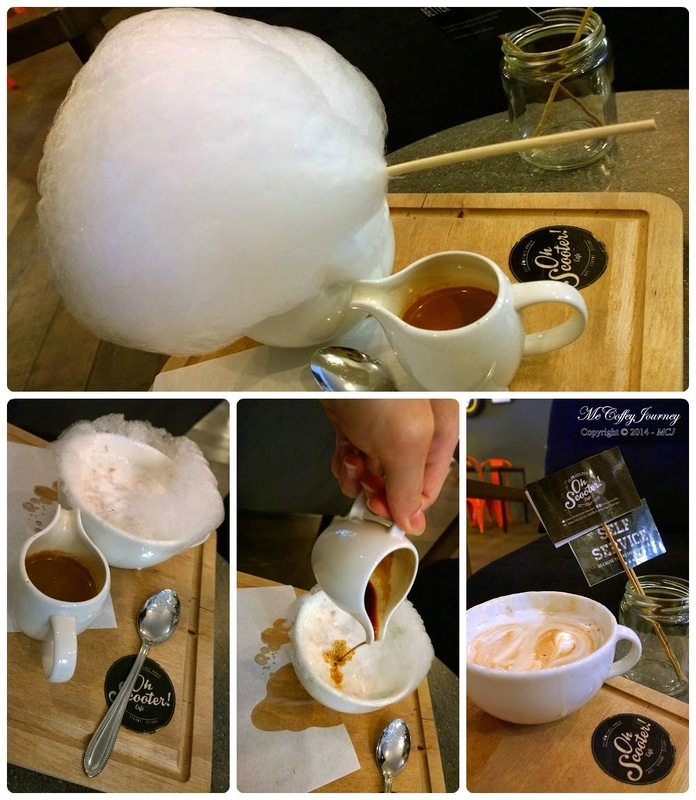 Amount of cotton candy to be added depending on how sweet you like your coffee to be. 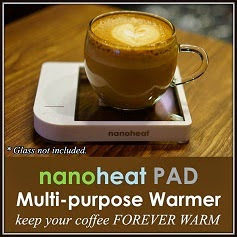 Caffeine level - Undissolved cotton candy will be seen at the top of the cup. 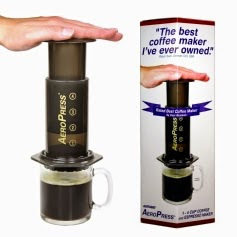 Pour the espresso in to dissolve the remaining cotton candy. Stir mixture - Mix the sugar and caffeine by stirring the substances in a circular motion. Oh Scooter Cafe's Hot Signature Coffee. 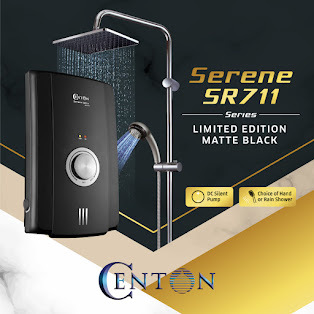 Powered by La Marzocco coffee brewer, all the usual espresso-based coffees are available too, which includes the ones used in the Signature Coffee. Signature Coffee (top left), Cappuccino (bottom left), and Iced Hazelnut Latte (right). 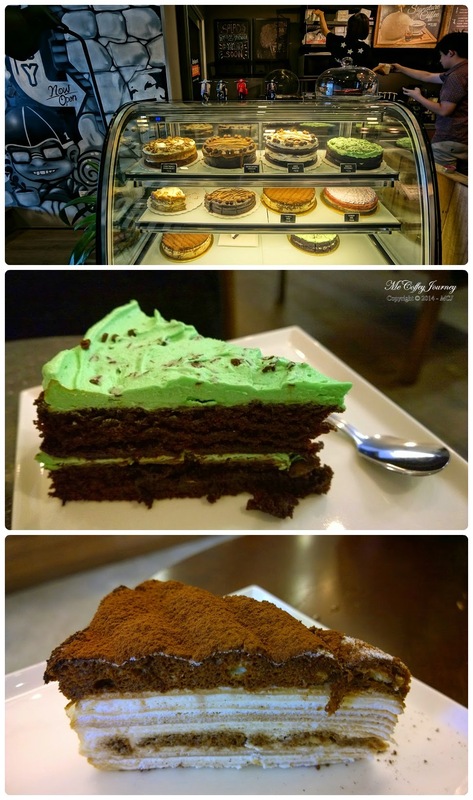 Scrumptious cakes are available to compliment your cuppa joe. 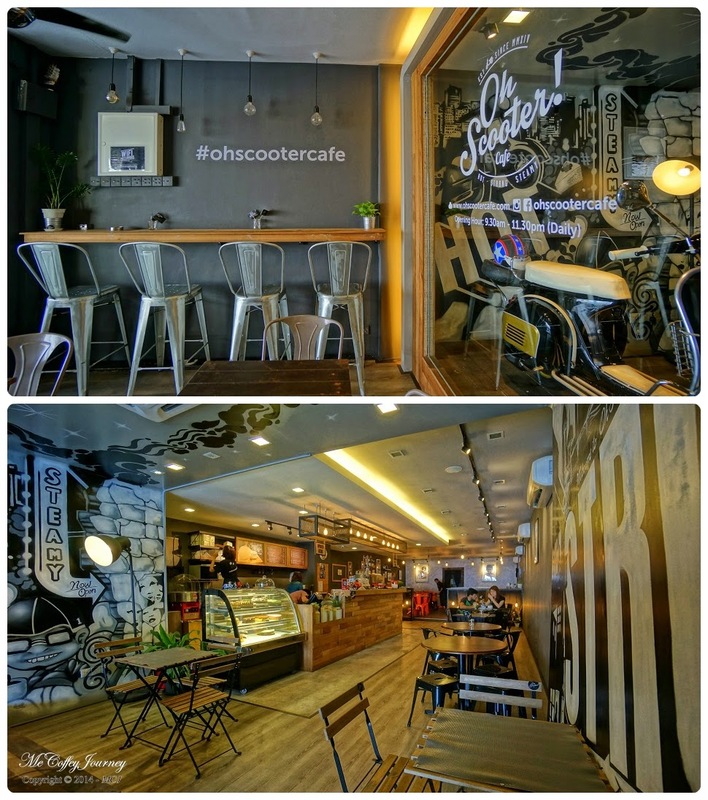 Beside cakes, salads, waffles, and sandwiches will be available at Oh Scooter Cafe soon. Monster Peppermint Cake (middle) and Tiramisu Crepe (bottom). 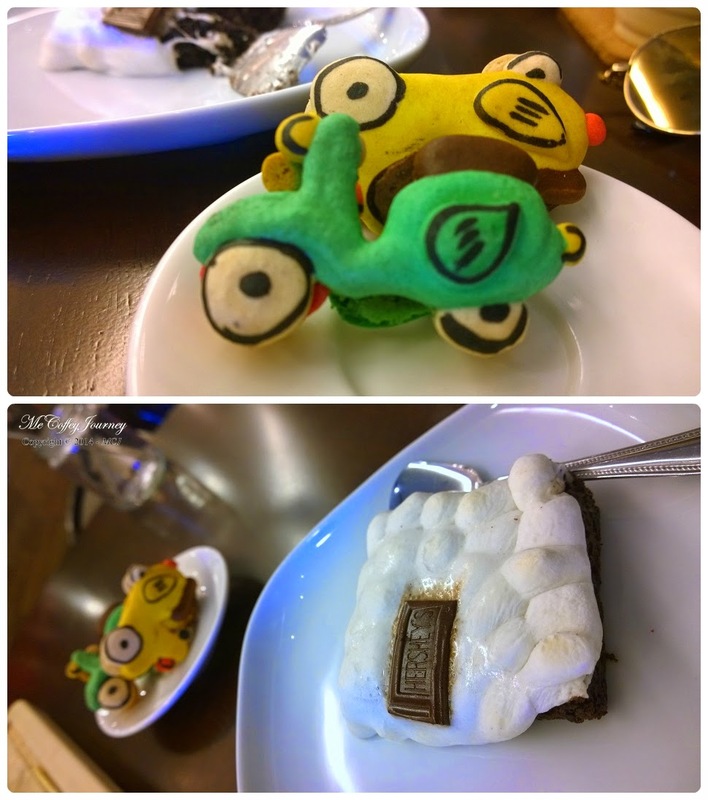 Check out the macaroons from Oh Scooter Cafe, made in the shape of scooters! They come in 5 different flavors, each in a different colored scooters: Earl Grey (red), Mango (yellow), Salted Caramel Apple (Purple), Rose (green), and Chocolate Banana (blue). Macaroons - Yellow = Mango and Green = Rose (top) and S'mores Brownies (bottom). 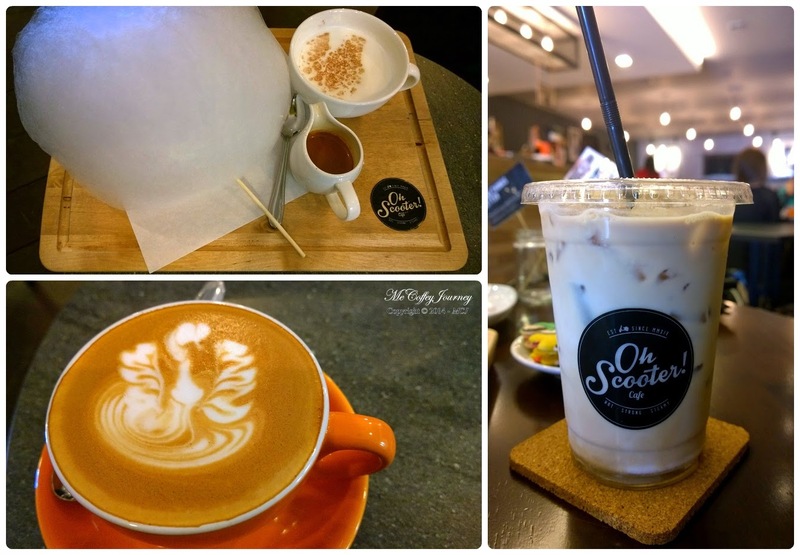 Oh Scooter Cafe adds the fun factor into the coffee drinking culture. 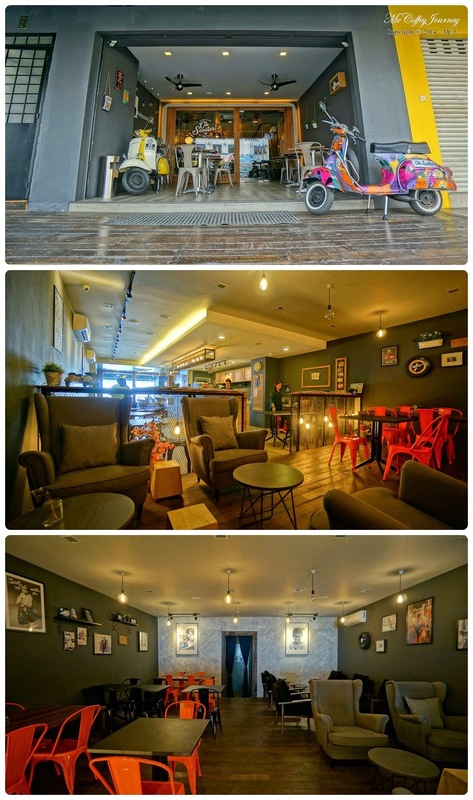 Together with a comfy and hippy environment, beautiful bikes, and practical opening hours (daily at 10 am to 11.30 pm), there is no surprise caffeiniacs are willing to travel a distance just to experience the Signature Coffee here.